SAN JOSE, Calif.—Oct. 17, 2018—Embedded systems designers can now easily and cost-effectively integrate the industry’s most advanced crypto-strong authentication into their designs with the DS28E50 DeepCover® secure hash algorithm 3 (SHA3-256) authenticator IC from Maxim Integrated Products, Inc. (NASDAQ: MXIM). With SHA3-256, the DS28E50 delivers the latest technology for challenge-and-response authentication, providing the strongest defense against counterfeiting, unauthorized usage and other application problems in a secure IC solution suited for teams with limited or no cryptography expertise. 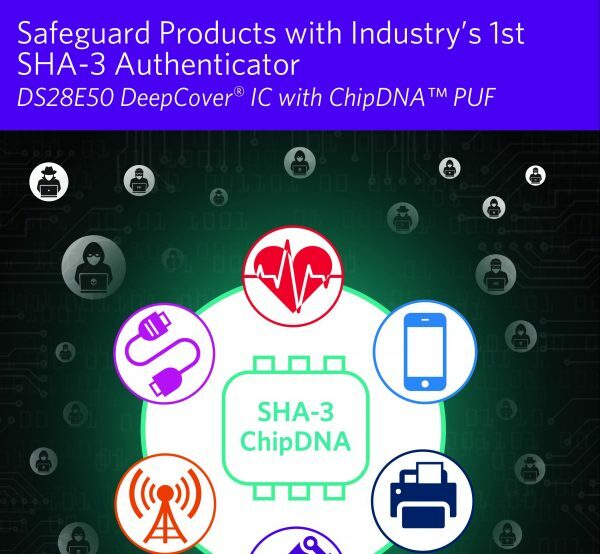 In addition to providing the industry’s first SHA3-256 authentication IC, the DS28E50 also integrates Maxim’s patented ChipDNA physically unclonable function (PUF) technology to prevent the IC-level attacks that are routinely attempted on security ICs. With ChipDNA technology, which is derived from the naturally occurring random analog characteristics of fundamental MOSFET devices, secret keys that protect all DS28E50 stored data are generated only when needed and are never stored on the chip.